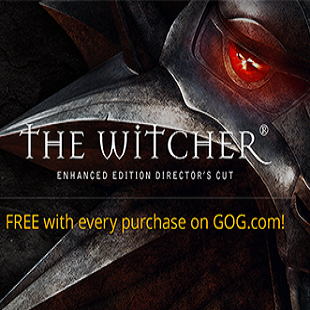 Customers who make any purchase at GOG before October 17th will receive a free copy of The Witcher: Enhanced Edition. GOG has a pretty extensive library spanning multiple genres and time periods. That being the case, if there are any games among the site's multitudes that you've been itching to buy, now may be the time to do it. We say that because the online retailer has launched a new promo that could arguably be counted as one of its better recent deals. Until October 17th, any purchase you make at GOG will be rewarded with a free copy of The Witcher: Enhanced Edition. Launched to close out GOG's fifth anniversary celebrations, The Witcher giveaway was announced alongside another promotion centered around the recent strategy RPG Dragon Commander. Firstly, GOG is offering shoppers a 40 percent discount on the game until October 14th. Additionally, however, the digital retailer is also giving away two custom miniatures based on dragons from the game. If you're interested in entering to win one of the minis you can head over to the GOG Facebook page. While the Dragon Commander promo and contest are both pretty nifty in their own right, we will admit that getting The Witcher for free does rank a bit higher on the scale of awesome, in our opinion. While it definitely has some rough edges, and is arguably dwarfed by its superior sequel, The Witcher: Enhanced Edition is still a fun RPG that offers a ton of depth along with an interesting, branching storyline. It's a title that fans of role-playing really should give a try.